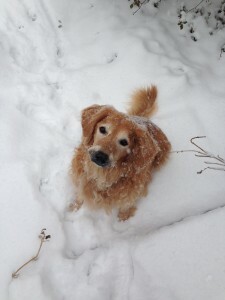 I adopted Missy in January 2013 from the Delaware Valley Golden Retriever Rescue in Pennsylvania. After losing my nearly 14 year old golden, Casey, to cancer at the end of 2011, I was finally ready to open up my heart to another dog and I thought my 10 year old golden Max needed a friend. I saw Missy posted on the website and something about her photo just caught my eye. She had been surrendered to the rescue by her family after being with them her whole life (9 years). They could no longer afford her (both the vet bills and the special food that she needed to deal with her food allergies) and they were tired of dealing with her environmental allergies. Missy was very ill when she entered the rescue, her allergies had gotten out of hand and she had multiple infections that made her lose much of her hair and made her very sick. The folks at the rescue were able to nurse her back to health and get her ready for her furever home. Max and I met Missy in January and we both fell in love with her. We immediately put her in the car and drove her back to Virginia with us. I knew of her allergy issues but I was convinced that she was “my project” and I was brought into her life for a reason and my job was to get her well and make her happy. When I got Missy home, I noticed she was a little chubby and seemed to have a hard time walking. After an MRI, we discovered that she had a tumor on her spleen. Dr. Pan at VCA removed the nearly 6 lb. tumor from her abdomen, along with her spleen. Everything was benign and I think Missy was a starting to feel much better, except she could not shake the nasty ear infection that she had. Missy had chronic ear infections for nearly her whole life and after an ear culture, we discovered that she had MRSA in her ear. We were eventually successful in treating the infection in her ear (but unfortunately it has currently returned) and I thought we were on the path to recovery and were ready to take on allergy season. We proactively started Missy on Atopica in the spring. I think it helped to some extent but all through the summer, she struggled a lot with allergies. She licked her arms constantly and ultimately wound up with a MRSA infection on her belly. Missy was still on doxycycline for her belly infection when she had a seizure in the middle of the night almost a month ago. It scared the heck out of me and I quickly took her to Dogwood. Missy was diagnosed the next day with lymphoma. I was shocked and devastated since I lost her brother Max suddenly and very unexpectedly to hemangiosarcoma in May. 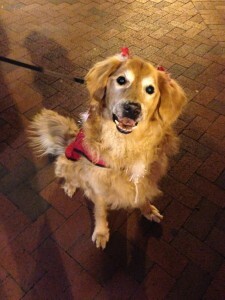 There was nothing that I could do for Max but the doctors at Dogwood felt that Missy stood a chance with chemo. She is currently a patient with the Oncology group at Dogwood and is undergoing chemotherapy with a prognosis of 6-8 months. So far, she has been reacting well to it and has been a trooper. Even though I knew Missy would be a “project” because of all of her issues, I didn’t anticipate the magnitude of the project and the expense. However, that being said, I wouldn’t change a thing and I would do it again in a heartbeat. Missy is the sweetest, gentlest dog that I have ever met and I have never for a second regretted adopting her. Despite what I am assuming was neglect with her previous owner, she has really blossomed over the past 9 months. When I take her out to events, she now seeks attention from people and adores the affection, versus trying to blend away in the background. I think she is happy, regardless of the numerous health challenges that she has faced and continues to face. Of course I am hopeful that the chemo will be successful and we will be together for more than 6-8 months, but even if we are not that fortunate, I will always treasure all of the time that we are together.